Lemon GreenTea: Smart partners with 20th Century Fox for "X-men" and "Smart X-perience"
Smart partners with 20th Century Fox for "X-men" and "Smart X-perience"
With Superhero fans all hyped up to witness the world’s powerful mutants in “X-Men: Apocalypse,” the country’s unrivaled mobile services leader Smart Communications has teamed up with 20th Century Fox through its local distributor Warner Bros. for one of this year's most anticipated films, which opens in 3D and IMAX cinemas on May 18. As the official mobile partner for “X-Men: Apocalypse, Smart is unleashing the most epic round of awesome experiences, perks and prizes exclusive to its subscribers, giving them a chance to win the SMART X-PERIENCE, an ultimate adventure that features a trip for (two) 2 to any Airbnb listing in Southeast Asia; a group pass for an X-Men-themed activity at Mystery Manila; and Uber Black vouchers. Also up for grabs are brand new devices such as the Samsung Galaxy S7 and LTE Pocket WiFi, perfect for taking their dose of X-MEN: APOCALYPSE content on the go. To join the promo, just register by texting XMEN REG <NAME/AGE/ADDRESS> to9999 free of charge. For the complete mechanics, simply text XMEN to 9999. Smart users can accumulate e-raffle entries with every top-up of select Smart Prepaid Big Bytes offers (50, 99, 299, or 799); purchase of a Smart Prepaid or Smart Bro Prepaid SIM; and sign-up or renewal for select Smart Postpaid and Smart Bro Postpaid Plan. 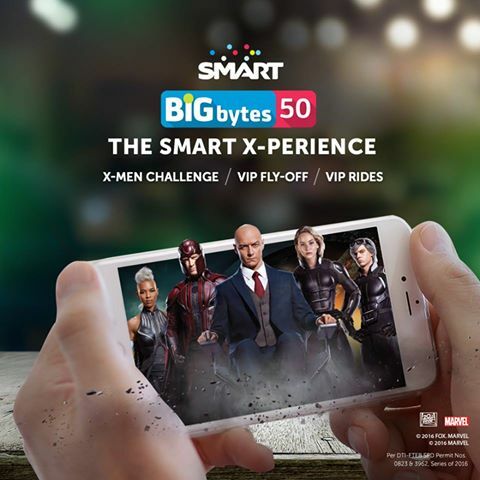 To take the X-men: Apocalypse experience to another level, Smart has also joined forces with Mystery Manila to give all Smart subscribers a FREE PASS to the X-Men-themed challenge at Century Mall in Makati City. This unique experience will allow X-Men fans to gather their squad and summon their inner superhero in unraveling a thrilling mystery – for the perfect group activity this summer. To secure a slot for your FREE PASS, simply register atwww.smart.com.ph/XMENAPOCALYPSE. Smart’s dedicated portal also offers exclusive digital offers and interactive online challenges that give subscribers a chance to take home premium X-men: Apocalypse merchandise. “After the smashing success of Batman v Superman: Dawn of Justice, we are excited with "X-Men: Apocalypse," another sure-fire blockbuster X-perience for our beloved subscribers. This further stretches their film enjoyment through our arsenal of digital content and our brand of awesome experiences,” said Smart Brand Head Kathy C. Carag. Directed by visionary director Bryan Singer, X-Men: Apocalypse features a powerhouse cast of warring mutants as the immortal Apocalypse (Oscar Isaac) takes Magneto (Michael Fassbender) into his fold to create a new world order, prompting Raven (Jennifer Lawrence) and Professor X (James McAvoy) to unite and lead a team of young X-Men to save mankind from complete destruction. For more information on Smart’s exclusive X-Men: Apocalypse offers, visitwww.smart.com.ph/XMENAPOCALYPSE and follow Smart’s official accounts on Facebook (www.facebook.com/SmartCommunications), Twitter and Instagram(@LiveSmart). Level up your "X-Men: Apocalypse" experience with Smart's most awesome perks and prizes! Text XMEN to 9999 now!